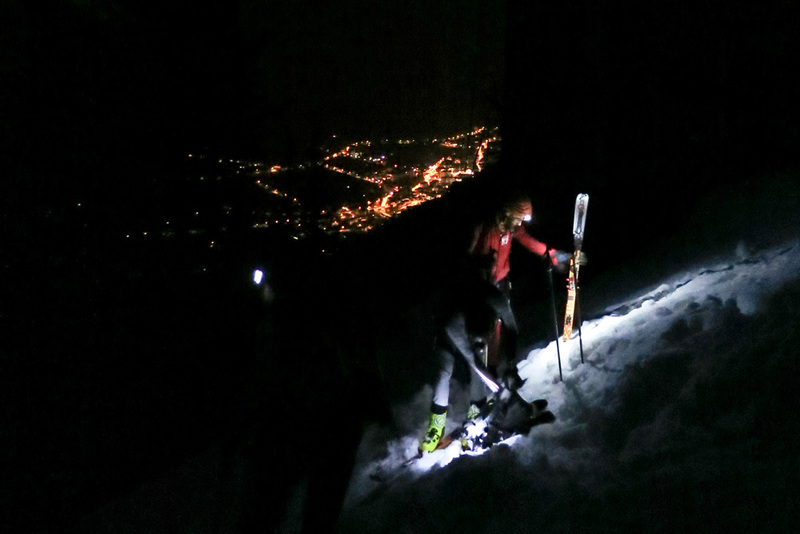 Perspectives on fast and light: Skiing Mont Blanc from the valley floor. 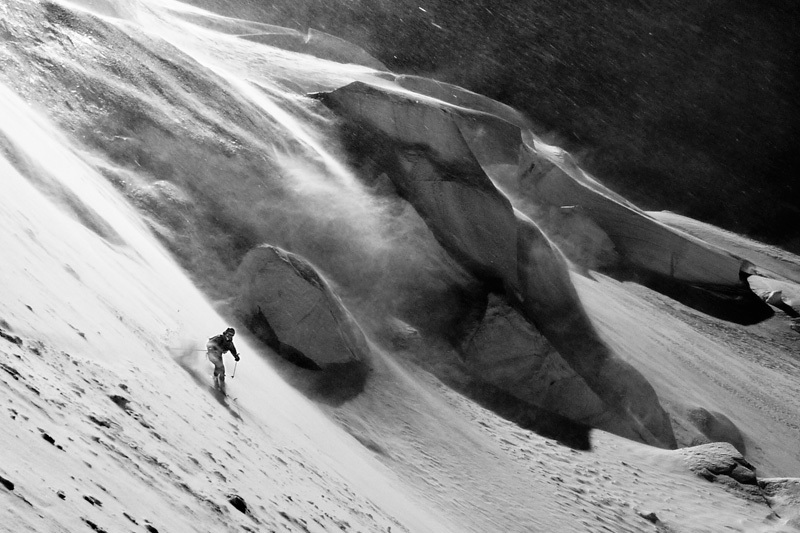 Misha Gopaul descending the north face of Mont Blanc in blustery conditions. 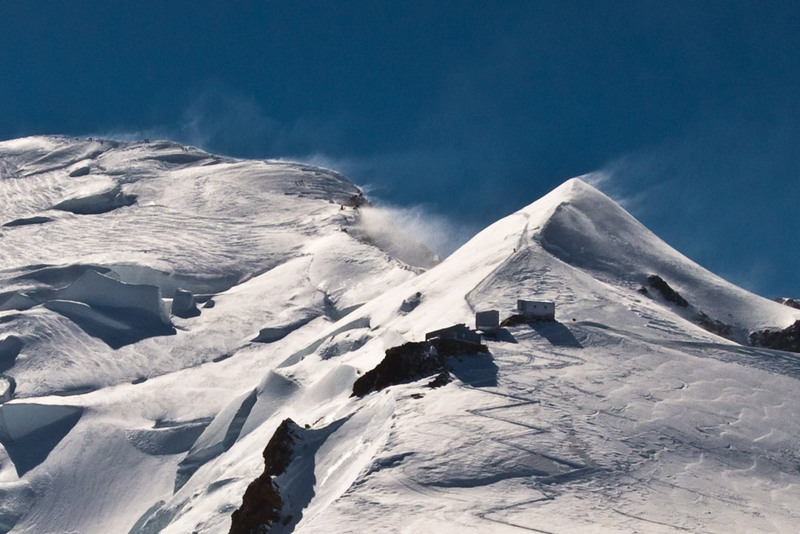 I had never particularly noticed the Arête Royale (N ridge of the Dome de Gouter) before, or noticed how direct a passage it offers to the upper ridge of Mont Blanc. Looking up from the valley, or across from the Aiguille du Midi, the north side of Mont Blanc seems to be a vast expanse of jumbled glaciers, seracs and plateaus, linked by few lines of weakness that look more or less reasonable depending on how much snow is filling in the glacial terrain. It is not particularly steep terrain compared to much of the Massif, but there are few ways up Mont Blanc that are not exposed to serac fall. 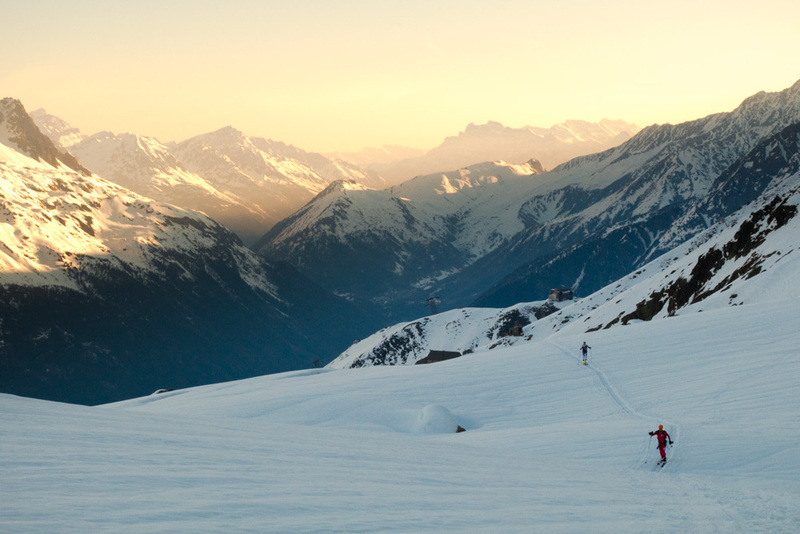 The seed had been sown several years ago to ski to the summit from the valley floor in a day, but at that point I hadn’t discovered lightweight ski mountaineering kit, or met the characters who would lead me astray into the world of SkiMo racing. In the meantime I had been up to the summit a handful of times before from different directions, most recently up the Peuterey Integrale with Ally Swinton. (Rab blog here : http://blog.rab.uk.com/2012/08/06/peuterey-integral-ally-swinton/). This was the only previous time I had traversed the summit of Mt Blanc from the valley floor and, including the approach day from Val Veny to the Borelli hut, the journey spread over three days (and a further two days stuck in the Midi in high winds on the way down!). We set out with skis on our backs from the Mont Blanc Tunnel entrance at 4.30am, the temperature fresh, but certainly not cold. The track to the old lift stations wound its way rapidly up the fall line, and we settled into a fast rhythm, probably faster than we might have chosen. I think we may have neglected to discuss with Nuno, the strong Portuguese ski racer who was the fourth member of our team, what kind of pace we were aiming for. Ben Barsley, Misha Gopaul and I had skied a lot together this winter and travelled well as a team. We understood what we each wanted to get out of the day. The muddy springtime path gave way to intermittent snow patches after a few hundred metres vertical, and finally at the old lower ‘Para’ lift station we put on skis. Looking through binoculars the day before, it was evident this first section was going to be arduous, as the whole ‘Para’ face had avalanched down to the ground of grass and rock slabs, triggered by the remotely detonated ‘gas-ex’ devices high on the slopes. The slopes didn’t pose much hazard now, and with a mild overnight freeze the snow was firm. Nevertheless we had to remove skis and boot several times across avalanche debris and then back and forth across steep ridges and gullies. Nuno was still setting a strong pace up the passages of icy and sketchy combat skinning, despite all the evidence that the conditions weren’t ideal. Light filtered over the horizon, and to our surprise in the gloom we came across a German man with a split-board attached to a massive backpack, proposing the same destination as we were. In big soft boots he was making hard work of the steep snow, punching through the solid crust to the soft rotten layers beneath. We put our skis on and zigzagged our way up, the sky glowing briefly orange at the horizon and reflecting off the snow around us. The slopes were smooth and steepened up past the upper disused lift station. Skinning became delicate and required careful pole support: with very narrow skis and short skins the relationship between skin and snow surface is even more binary than usual; it all seems fine, then before you know it you are pulling your face out of the snow. We met the tracks traversing in from the Midi at about 2700m. We had been waiting a while for a settled weather window and for guided parties to put a nice skin track in. The hope was that others ahead of us would cut down on our effort by finding the most efficient line across the heavily crevassed glaciers. As these factors fell into place, underneath a full moon, all that was left to be decided was which route and what gear to take. We had been toying with the project of linking a traverse from Contamines, up and across the Dômes de Miage and the Aiguille de Bionnassay and then up to the summit; however we had info that this route wasn’t in especially good condition, and this early in the season it is unlikely that the Bionnassay ridge had been tracked. A good track had been put in from the Aiguille du Midi mid-station, across to the Grand Mulets refuge and up the Arête Royale to the Gouter and summit ridge. 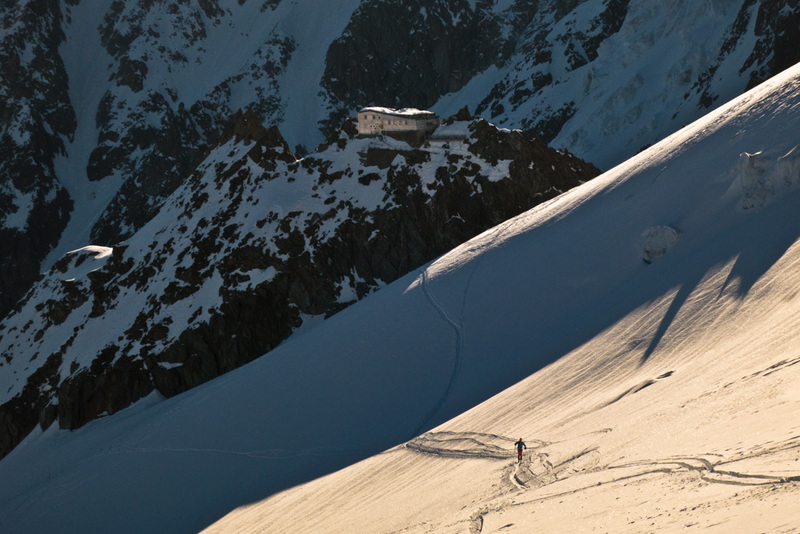 This is now the most common winter ski mountaineering route, as the Arête Royale is much less threatened by seracs than the traditional Grand Mulets route as marked on the IGN map. In terms of gear and nutrition we had to decide how fast and light we wanted to be. In fact we had had most of these discussions before skiing the Chamonix – Zermatt Haute Route non-stop a few weeks earlier (http://blog.rab.uk.com/2013/04/09/diary-of-a-skimo-racer-jon-morgan-2/). We were certainly not trying to break any records – for that kind of speed we would need to cut a few more safety corners – i.e. no crevasse or avalanche rescue gear etc, go solo or in a pair rather than a team of four and most importantly be much fitter! We wanted to go for a fast enough ascent to catch the window of opportunity that occurs most days between when the lower altitude snow softens up and becomes pleasant skiing, and later when it may become dangerously soft and unstable. We wanted to be moving efficiently enough that the day didn’t drag, but casually enough to talk, take some photos and enjoy the experience. We also wanted to remain as a team and not push on individually at race pace – to eat sandwiches and enjoy the day in real time rather than squirt energy gels down, suffer to the max and enjoy it in retrospect… maybe we can do that another time! In reality our approach had greater emphasis on the light than the fast. The speed was more a by-product of the choice of gear, rather than an end in itself. We each took Ski Mountaineering race skis, boots, poles and packs, harness, lycra one piece suits (they look daft, but are very functional! ), with just a base layer beneath, a windproof on top, a pair of liner gloves and mittens, a buff and a helmet. For higher up we had an ultralight down jacket and pertex trousers, alloy crampons + axe, lightweight shovel and probe, an ultra light crevasse rescue kit. Along with this we took 2-3 litres of juice each, a handful of chocolate and cereal bars, and the aforementioned sandwiches! The first section of the climb up the ‘Para’ face certainly added to the aesthetic of the adventure and satisfaction of the day, but in these conditions added little fun. From here we were pleased to be on a solid trail, beaten into the snow over the last two days of stable weather. The ‘Jonction’ is the area where most of the higher glaciers flowing off the summit ridges meet in a jumbled catastrophe of towering ice blocks, before pouring down the final steepening to the valley. In summer this route is un-navigable, but after a winter snowfall of over ten metres it looks like a fairly safe proposition, with only the largest towers and crevasses still in evidence. The track winds through with the confidence of a couple of hundred passengers then breaks out onto the smoother slopes below the Grand Mulets refuge. Ben Bardsley skinning up. Grand Mulets Refuge behind. By this point Nuno had cruised off the front of our group while we paused to eat. We got intermittent glimpses of him higher up the slopes above until he disappeared over the crest of the ridge. Nearing the Arête Royale it became more and more defined before the skin track ended at a foot up the steepening ridge and across an icy section. Thankfully after the passage of previous parties there were some steps developing in the ice, as aluminium crampons don’t perform very favourably on hard surfaces. The forecast had been for winds decreasing moderate-light, but there were still strong plumes hailing off the summits and so the outcome was looking very uncertain. As we moved up the ridge it became rapidly more exposed to the wind, and, as I was still in unprotected lycra, I was pretty keen to get up to the plateau and get windproofs and down jacket on. Misha Gopaul and Ben Bardsley on the short icy section of the Arête Royale. Crossing over towards the Vallot we came across Nuno waiting for us. He had been hanging around too long and gotten cold so said his goodbyes and headed back down. There were stacks of teams working their way up and down the summit ridge, stooping against the wind, having left their skis at the Vallot. When we went inside to warm it seemed to have been warmer outside in the lee of the hut in the sun. Despite the strong winds the air temperatures were soaring even at 4300m. Nevertheless even with all our clothes on we were cooling down quickly, so we got moving again and carried on up the ridge on foot with skis on the pack. The Vallot Refuge and final ridge to the summit. There was a soft foot trench but it was filling in with spindrift as quickly as we walked. The wind stung the face, so I spent most of the time looking down at my feet, plodding up in a dreamy hypoxic fuzz getting blown side to side. We passed several large teams mostly roped up in a manner that was offering them dubious security should one of them slip. At this point fast and light didn’t feel quite so smart. We had only a bare minimum of clothing, having expected low winds, and I felt rather exposed to the elements. Only the exertion of continuing moving up kept the body warm. Surprisingly, on the final hundred metres to the summit the winds dropped marginally. It was just enough to tip the overall balance from significant discomfort to a sense of wellbeing and satisfaction. We embraced each other, looked briefly down and around the gathering ridges. Eight hours and six minutes from the valley floor was reasonable given the conditions. No epics. A little, though not too much suffering – probably just light enough then. Clouds were building below us in Italy, and we ducked off the ridge to shelter a little and snap into our ski bindings. 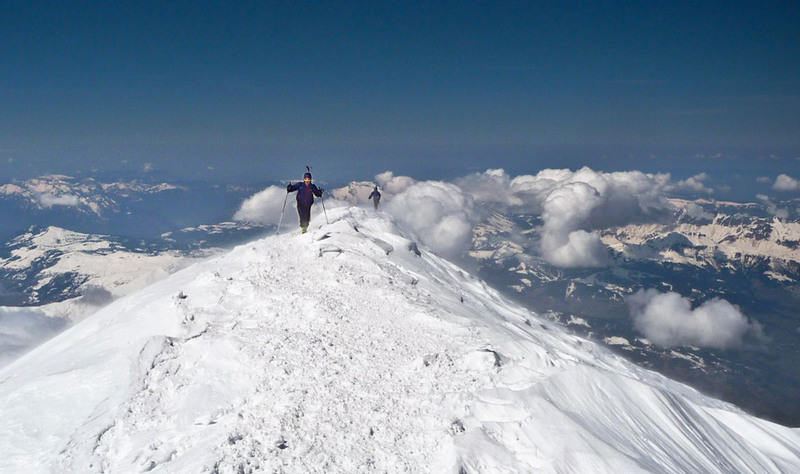 Me and Misha Gopaul reaching the summit of Mont Blanc. Photo courtesy Ben Bardsley. After an icy top section we dropped rapidly down through the impressive hanging seracs of the north face in creamy powder snow and spilled back out onto the corridor down back to the Grand Mulets hut. The route has significant exposure from the seracs and is crevassed much of the way down, so it is prudent to not hang about here. Skinning solo up the route was the German snowboarder we had seen in the half-light of the morning. As we dropped altitude we quickly warmed up. We stopped for a last time and stripped clothes down, finished our water and skied down through the smooth softening snow. As I look up from the valley now when the afternoon light swings across the summits, the Arête Royale seems the most starkly defined boundary of light and shadow. It always seems surprising to me how greatly traveling a route changes its significance in my mind. When we experience and share the intimate geography of a mountain it becomes part of our story. The ideas we dreamt become our history. 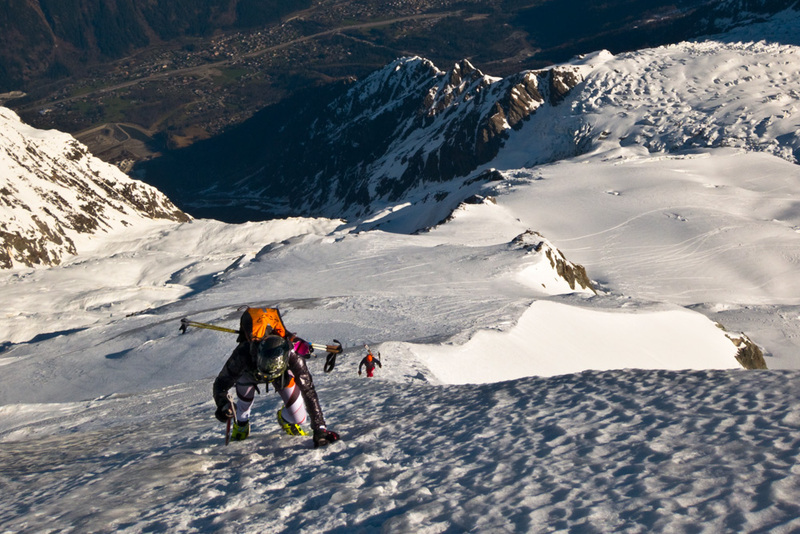 The journey from Chamonix church to the summit and back has been made in 5h15 by Pierre Gingnoux and Stephan Brosse in 2003.